I can't say I understand it, but not everyone likes scary Halloween costumes. I was a vampire pretty much every year, but some girls would rather be fairy princesses or beauty queens. 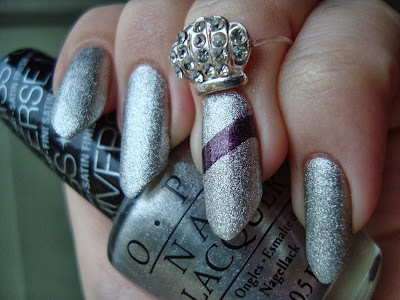 I'm not really into pageants, but OPI's first Miss Universe collection is still the only one I have every shade from. I love Swimsuit...Nailed It!, Crown Me Already, Miss Congeniality, and It's MY Year, so I was really excited when a sequel was announced. This year's bunch is a trio, two creams and a "Satin". 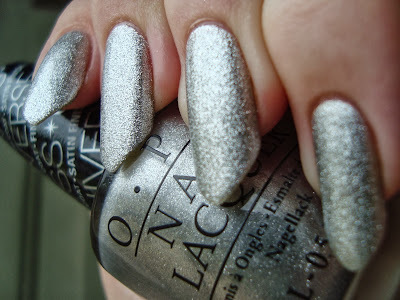 OPI's new Satin finish is a lot like Layla's Softouch. They both look textured, but feel smooth. 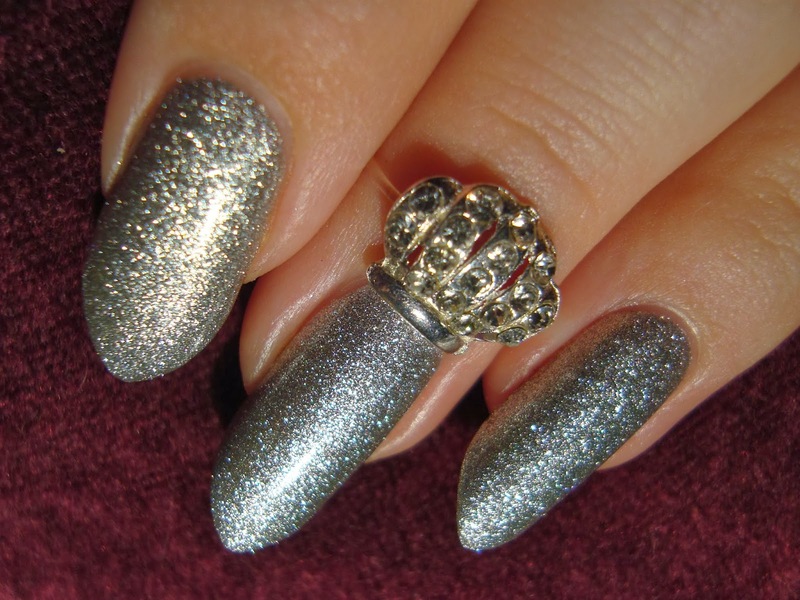 This Gown Needs A Crown is the first from OPI with this new finish, but there are two more coming up in their Gwen Stefani collection. It's the only shade from this collection that I bought...so far. I whimpered a little when I put Miss Youniverse back and I'm Feeling Sashy is appealing too. I may go back for them. Tempting! This Gown Needs A Crown is a shimmery silver with a "satin" finish. Pure gorgeousness, no? I adore silver polish in general, so I was bound to love it, but the finish is what really makes it. 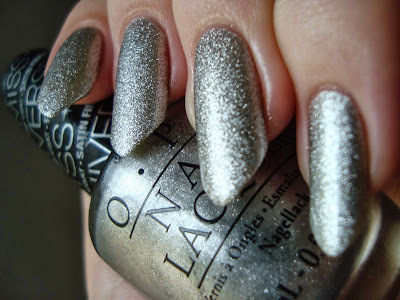 There's so much shimmer, yet it's got that same almost matte thing going that as Layla's Softouch finish. It gives it a really distinct and eye-catching look. The formula's good, but I needed three coats to be confident that I wouldn't have thin spots. I don't mind. This kind of beauty is worth an extra coat. The one downside is it's very slow to dry. Maybe it's just because the air conditioning is (FINALLY) off, but I managed to dent it a little even after it seemed dry. The dent smoothed out well (you'd be able to see it in the next two photos otherwise), but it was still a little annoying. I went ahead and top coated it, against OPI's advice. Such a rebel, aren't I? There's more dazzle, for sure, when it's top coated. It glows...but I think I like it more without the glossy finish. It feels more unique that way. It almost looks like a very fine foil with top coat. The ring is on the tiny side, but not as tiny as it looks here. I'm holding it on with the other two fingers. It fits my pinkie well enough (tiny big snug), but isn't big enough for my other fingers. Update- I was about to take it off when I thought of a little extra touch. This nail needs a sash! 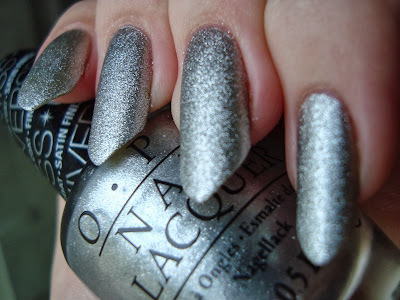 Bottom line: Love it and I hope OPI keeps up with this finish beyond the Gwen Stefani collection's gold and black. I used three coats, but if your nails are short two would probably do it. The ring is cute, but a little on the small side.